Rise of the Planet of the Apes was released on August 5, 2011, to critical and commercial success. The film was nominated for an Academy Award for Best Visual Effects. It was also nominated for five Saturn Awards including Best Director for Wyatt and Best Writing for Jaffa and Silver, winning Best Science Fiction Film, Best Supporting Actor for Serkis and Best Special Effects. Serkis's performance as Caesar was widely acclaimed, earning him many nominations from associations which do not usually recognize performance capture as traditional acting. A sequel to the film, Dawn of the Planet of the Apes, was released on July 11, 2014, and a third film, War for the Planet of the Apes, was released on July 14, 2017. Will Rodman, a scientist at the San Francisco biotech company Gen-Sys, is testing the viral-based drug ALZ-112 on chimpanzees to find a cure for Alzheimer's disease. ALZ-112 is given to a chimp named Bright Eyes, greatly increasing her intelligence. But then, during Will's presentation for the drug, Bright Eyes is forced from her cage, goes on a rampage, and is shot to death. Will's boss Steven Jacobs terminates the project and has the chimps slaughtered. However, Will's assistant Robert Franklin discovers that the reason for Bright Eyes' rampage was that she had recently given birth to an infant chimp. Will reluctantly agrees to take in the chimp, who is named Caesar. Will learns that Caesar has inherited his mother's intelligence and decides to raise him. Three years later, Will introduces Caesar to the redwood forest at Muir Woods National Monument. Meanwhile, Will treats his dementia-suffering father Charles with ALZ-112, which seems to restore his cognitive ability. Five years later, when Caesar reaches adolescence and sees a dog on a leash like his own, he questions his identity and learns of his origins from Will. Meanwhile, Charles's condition returns as he becomes resistant to ALZ-112. Caesar injures a neighbor, Douglas Hunsiker, while defending a confused Charles. As a result, he is placed in a primate shelter where he is tormented by a chimp named Rocket and the chief guard, Dodge Landon, but also where he befriends an orangutan named Maurice who came from a circus. Caesar learns how to unlock his cage, gaining free access to the common area. With the assistance of a gorilla named Buck, he confronts the sanctuary's alpha, Rocket and claims that position. Meanwhile, Jacobs clears development of a more powerful, gaseous version of the drug – ALZ-113 – when Will tells him it can also improve intelligence. Will takes the drug home to try to save his father, but Charles declines further treatment and dies overnight. After attempting to test the drug on a scarred bonobo test subject named Koba, Franklin becomes exposed to ALZ-113 and becomes ill. Attempting to warn Will at his home, he sneezes blood onto Hunsiker and is later discovered dead. Will attempts to reclaim Caesar, but the chimp refuses to go home with him so he could look after the other apes. Instead, he escapes from the facility and returns to Will's house, where he takes canisters of the ALZ-113. Upon returning, Caesar releases the gas and allows it to enhance the intelligence of the other apes. When Dodge attempts to get him back into his cage, Caesar speaks for the first time, yelling "No!" and gets in a fight which inadvertently leads to Dodge's death. The apes flee the facility, release the remaining chimps from Gen-Sys, and free more apes from the San Francisco Zoo on the way. 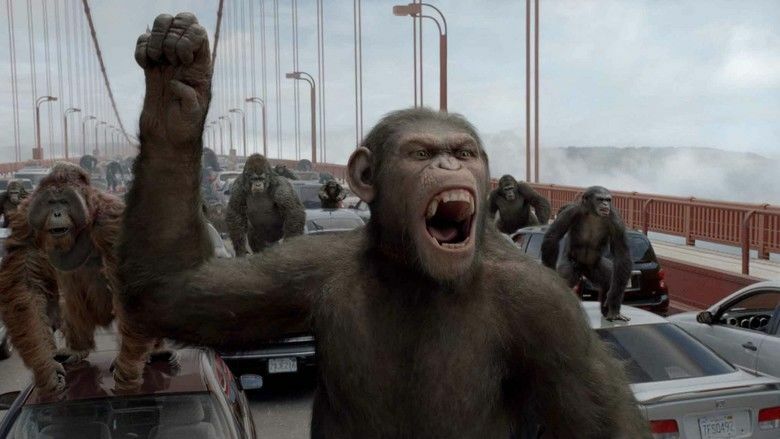 A battle ensues as the ape army fights their way past a police blockade on the Golden Gate Bridge to escape into the redwood forest. Buck sacrifices himself to save Caesar by jumping into the helicopter in which Jacobs is riding. The helicopter crashes onto the bridge, trapping Jacobs in the wreckage. Koba seizes his chance for revenge and sends Jacobs falling to his death in the bay below. As the apes find their way into the forest, Will arrives and warns Caesar that the humans will hunt them down, and begs him to return home. In response, Caesar hugs him and says that, "Caesar is home." Will, realizing that this is indeed their last goodbye, respects Caesar's wishes. The apes embrace their new lifestyle in the forest. In a mid-credits scene, an infected Hunsiker leaves his house for work as an airline pilot, arriving at San Francisco International Airport for his flight to Paris. His nose begins to drip blood onto the floor. A graphic traces the spread of the humanity-ravaging virus around the globe via international flight routes. 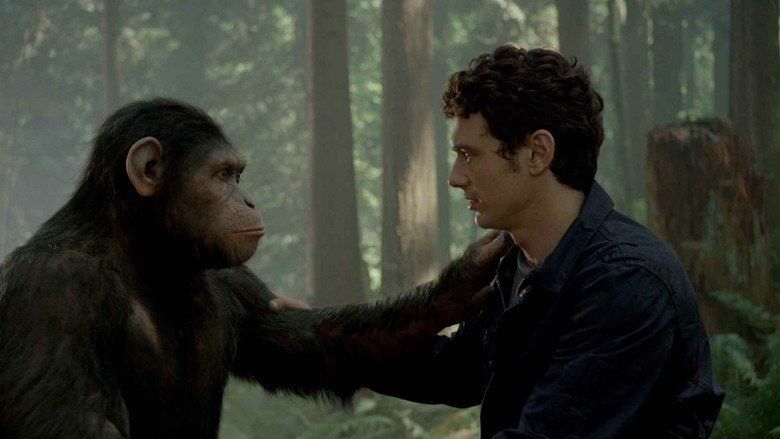 James Franco as Dr. William "Will" Rodman, a biologist who is trying to discover a cure for his father's Alzheimer's disease by testing ALZ-112 on chimps. He is a father figure to Caesar. James Franco was cast after talks with Tobey Maguire broke down. Freida Pinto as Caroline Aranha, a primatologist who starts a relationship with Will and grows attached to Caesar. John Lithgow as Charles Rodman, Will's Alzheimer's-afflicted father and a former music teacher who improves after Will gives him the ALZ-112 and forms a grandfatherly bond with Caesar. Brian Cox as John Landon, manager of the San Bruno Primate Shelter where Caesar is confined for a time. His full name is a reference to one of the astronauts in the original Planet of the Apes. Tom Felton as Dodge Landon, John's son and an animal caretaker at the shelter, who abuses the apes for sport. His first and last name are references to two of the astronauts in the original Planet of the Apes. David Oyelowo as Steven Jacobs, Will's arrogant boss. His last name is a reference to Arthur P. Jacobs, the producer of the original Planet of the Apes series. Tyler Labine as Robert Franklin, a chimp handler at Gen-Sys and one of Will's friends. His surname is a reference to Franklin Schaffner, the director of the original film. Jamie Harris as Rodney, a caretaker and a nightwatchman who is much kinder to the apes at the sanctuary and is regularly mocked by Dodge for this. David Hewlett as Douglas Hunsiker, Will's hot-headed neighbor. Chelah Horsdal as Irena, a nurse who is looking after Charles. 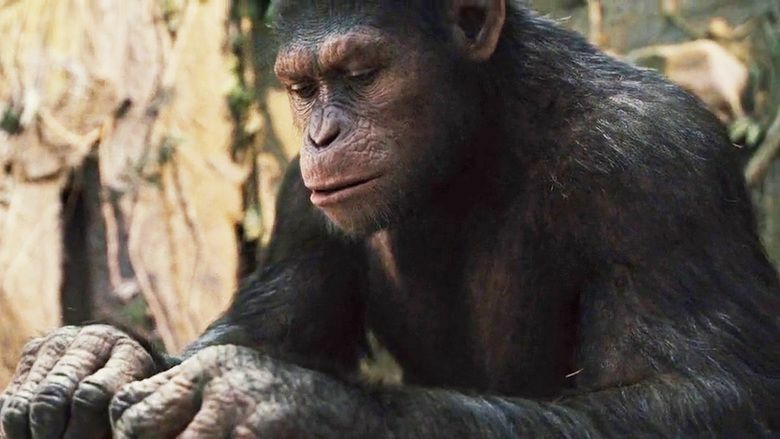 Andy Serkis as Caesar, a common chimpanzee whose intelligence is increased from inheriting ALZ-112 from his mother during her pregnancy, and who is raised by Will for eight years. Karin Konoval as Maurice, a wise and benevolent Bornean orangutan who was retired from the circus and knows sign language; he becomes Caesar's closest ally. Konoval also cameos as the court clerk whom Will briefly argues with about his appeal. His name is a reference to Maurice Evans who portray Dr. Zaius in the original Planet of the Apes. 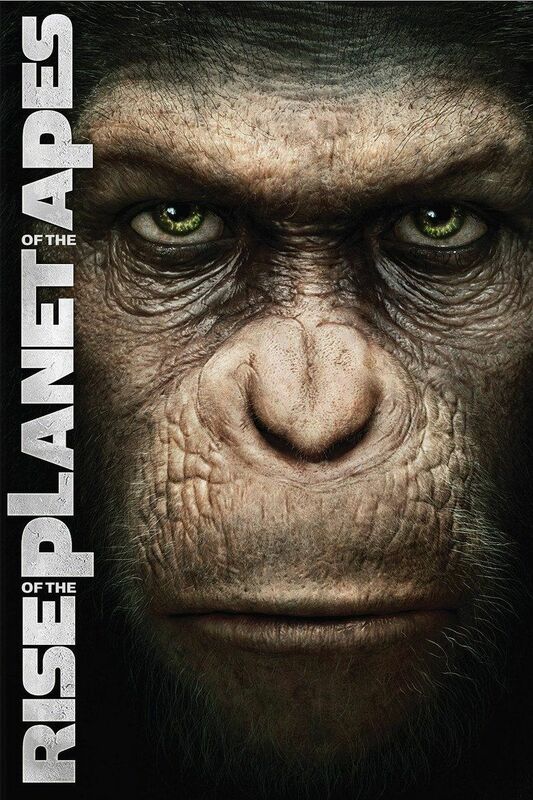 Terry Notary as Rocket, the dominant common chimpanzee at the ape sanctuary, until Caesar overthrows him. Notary also plays Bright Eyes, Caesar's mother who was captured in Africa. Richard Ridings as Buck, a Western lowland gorilla who pledges his allegiance to Caesar after he is freed by him. Devyn Dalton as Cornelia, a female common chimpanzee in the ape sanctuary. Jay Caputo as Alpha, the dominant male common chimpanzee of Bright Eyes' troop and Caesar's father. 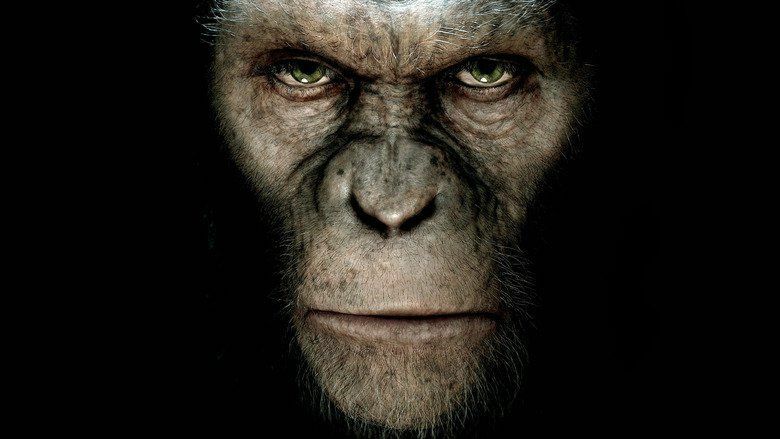 Christopher Gordon as Koba, a scarred and aggressive bonobo who has spent most of his life in laboratories and holds a grudge against humans. In 2006, screenwriter-producer Rick Jaffa was searching for a script idea. As Jaffa searched a newspaper articles clipping, one about pet chimpanzees that become troublesome to their owners and heartbroken for not adapting well to the human environment intrigued him. As Jaffa eventually realized it fit the Planet of the Apes series, he called his wife and screenwriting partner Amanda Silver to express his ideas of such a chimpanzee eventually starting the ape revolution, and then the couple started developing the character of Caesar. Jaffa indicated that "it's a reinvention" and if he had to pick between calling it a prequel or a reboot he would say it is a reboot: "It's a different story of who Caesar is, and how he came to be. So it's really kind of hard to put a label on it. We are hopefully rebooting it." He went on to say that "we tried really hard to create a story that would stand on its own and yet also pay homage and honor the movies that came before us." Jaffa and Silver then wrote a script and sold it to Fox, producers of the Apes franchise. The script added other elements which the couple had researched, such as genetic engineering. Several tributes to specific scenes, characters, and cast and crew from the previous Apes film series were added in the script. In particular, Caesar's treatment at the primate sanctuary parallels Taylor's treatment as a captive in the original film. In a segment of a video blog post, director Rupert Wyatt commented on the originality of the plot: "This is part of the mythology and it should be seen as that. It's not a continuation of the other films; it's an original story. It does satisfy the people who enjoy those films. The point of this film is to achieve that and to bring that fan base into this film exactly like Batman Begins." In a 2009 interview, Wyatt said, "We've incorporated elements from Conquest of the Planet of the Apes, in terms of how the apes begin to revolt, but this is primarily a prequel to the 1968 film...Caesar is a revolutionary figure who will be talked about by his fellow apes for centuries...This is just the first step in the evolution of the apes, and there's a lot more stories to tell after this. I imagine the next film will be about the all-out war between the apes and humans." Mark Bomback did an uncredited rewrite of the script. Filming began in July 2010 in Vancouver, British Columbia. Filming also happened in San Francisco, California (the primary setting of the film), and around Oahu, Hawaii, which doubled for the African jungle as the schedule and budget did not allow for location shooting in Africa. As the apes in Rise were meant to be actual apes, the producers decided not to use actors in ape suits. After considering real apes, instead Weta Digital created the apes digitally in almost every case through performance capture. Advances in the technology allowed the use of performance capture in an exterior environment, affording the film-makers the freedom to shoot much of the film on location with other actors, as opposed to the confines of a soundstage. The main breakthrough was a camera that enabled viewing the motion capture dots in daylight, employed mostly for the Golden Gate Bridge battle. A maximum of six actors could have their movements captured, with larger ape crowds using fully digital animals animated using Weta's move library. The Golden Gate Bridge set used both a physical set which was extended digitally, and a fully computer-generated model of the bridge that also included the ocean and nearby hills. After shooting the actors playing humans interacting with others wearing the motion capture suits, a clean plate was shot with actors for extra reference. Actor-stuntman Terry Notary guided the actors on realistic ape movement, while Weta studied the chimps in the Wellington Zoo for reference. The digital apes also received detailed models with skeletons, muscles and nerve tissue layers for accurate animation. Cast models of apes' heads and limbs helped the texture department replicate skin details such as wrinkles and pores. Given the difference between human and chimpanzee facial muscles, the animators tweaked the performance through a new facial muscle system adding dynamics, ballistics, and secondary motion. As the silent performance required expressive eyes, a new eye model was made to depict both greater accuracy in muscle movement in and around the eyes, and also tears, pupil dilation, and light refraction. 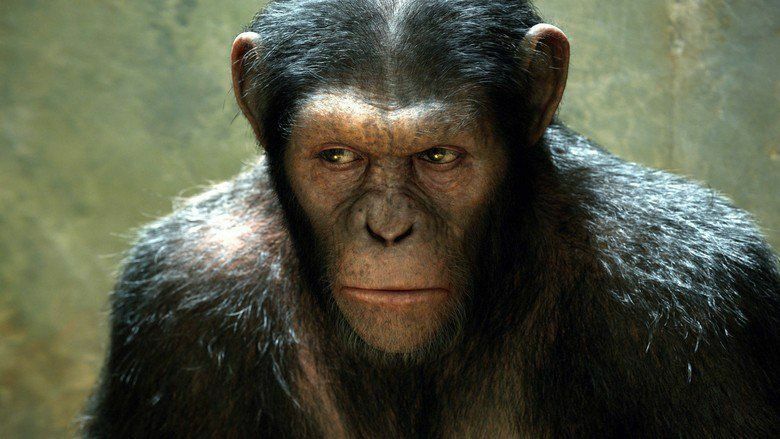 While Andy Serkis was the primary performer for Caesar, as the effects team considered that at times "Andy overcame the character," other motion capture team actors were also used, especially Devyn Dalton, whose height matched that of a chimpanzee. Along with that, they used Notary to play Caesar in stunt-filled scenes such as the Golden Gate Bridge scene. The score for the film was written by Patrick Doyle and performed by the Hollywood Studio Symphony conducted by James Shearman. The main concern was to have the music help progress the plot in the scenes without dialogue, for instance, conveying the emotions of Caesar's relationships with Will and Charles. To turn the score into a "driving force that keeps audiences paying attention," Doyle employed an African-American chorus and focused on percussion and "low and deep" orchestra sounds. Doyle collaborated closely with the sound department to make the music complement the sound effects, including writing a recurring theme based on their recording of a chimpanzee. On review aggregator Rotten Tomatoes, the film has an approval rating of 81% based on 252 reviews, with an average rating of 7.1/10. The site's critical consensus reads, "Led by Rupert Wyatt's stylish direction, some impressive special effects, and a mesmerizing performance by Andy Serkis, Rise of the Planet of the Apes breathes unlikely new life into a long-running franchise." Another review aggregator, Metacritic, gave the film a score of 68 out of 100, based on 39 critics, indicating "generally favorable reviews". 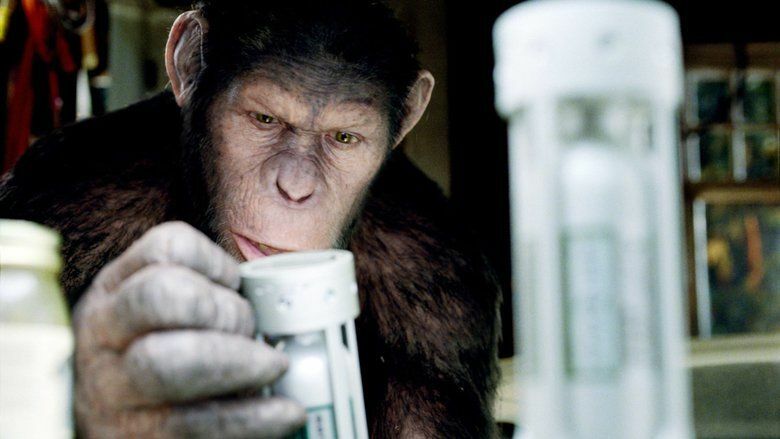 Roger Ebert gave the film 3 out of 4 stars and praised the role of Caesar and Andy Serkis by stating it was a "wonderfully executed character" and "one never knows exactly where the human ends and the effects begin, but Serkis and/or Caesar gives the best performance in the movie." Giving the film 5 out of 5 stars, Joe Neumaier of Daily News labelled Rise of the Planet of the Apes as the summer's best popcorn flick. Nick Pinkerton of The Village Voice wrote, "Caesar's prison conversion to charismatic pan-ape revolutionist is near-silent filmmaking, with simple and precise images illustrating Caesar's General-like divining of personalities and his organization of a group from chaos to order." Roger Moore of Orlando Sentinel wrote, "Audacious, violent and disquieting, "Rise of the Planet of the Apes" is a summer sequel that's better than it has any right to be." He gave the film 3.5 out of 4 stars. Manohla Dargis of The New York Times praised the film by saying, "Precisely the kind of summer diversion that the studios have such a hard time making now. It's good, canny-dumb fun." She also gave it 3.5 out of 4 stars. Peter Travers of Rolling Stone noted that the film has mixed "twists lifted from 1972's Conquest of the Planet of the Apes and 1999's Deep Blue Sea". Rise of the Planet of the Apes made its debut in the United States and Canada on roughly 5,400 screens within 3,648 theaters. It grossed $19,534,699 on opening day and $54,806,191 in its entire opening weekend, making it #1 for that weekend as well as the fourth-highest-grossing August opening ever. The film held on to the #1 spot in its second weekend, dropping 49.2%, and grossing $27,832,307. 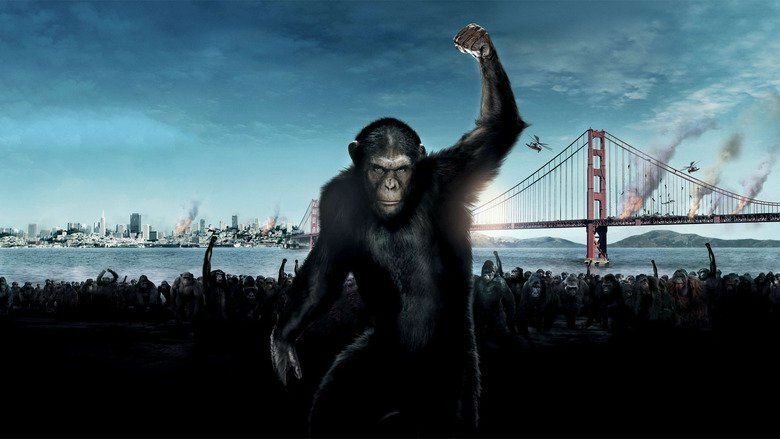 Rise of the Planet of the Apes crossed the $150 million mark in the United States and Canada on its 26th day of release. Entertainment Weekly said that this was quite an accomplishment for the film since the month of August is a difficult time for films to make money. The film ended its run at the box office on December 15, 2011, with a gross of $176,760,185 in the U.S. and Canada as well as $305,040,864 internationally, for a total of $481,801,049 worldwide. Rise of the Planet of the Apes was released on Blu-ray Disc, DVD, and Digital Copy on December 13, 2011. Regarding the story setting up possible sequels, director Rupert Wyatt commented: "I think we're ending with certain questions, which is quite exciting. To me, I can think of all sorts of sequels to this film, but this is just the beginning." 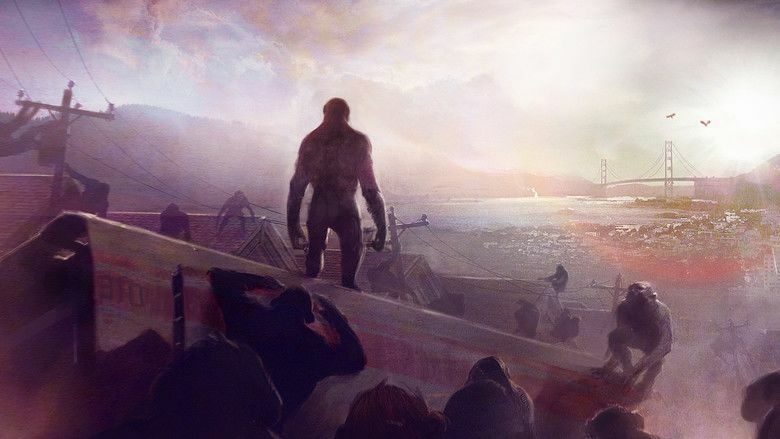 Screenwriter and producer Rick Jaffa also stated that Rise of the Planet of the Apes would feature several clues as to future sequels: "I hope that we're building a platform for future films. We're trying to plant a lot of the seeds for a lot of the things you are talking about in terms of the different apes and so forth." On May 31, 2012, 20th Century Fox announced that the sequel would be named Dawn of the Planet of the Apes. Reports said that Wyatt was leaving the sequel due to his concern that a May 2014 release date would not give him enough time to properly make the film; he was replaced by Cloverfield director Matt Reeves. Jaffa and Silver returned as producers and to pen the screenplay, with rewrites from Scott Z. Burns and Mark Bomback. Taking place ten years after Rise, Dawn follows Caesar's growing nation of evolved apes threatened by human survivors that put both sides in the brink of war. Andy Serkis, Terry Notary and Karin Konoval reprised their roles as Caesar, Rocket and Maurice. James Franco returned as Will Rodman in a "cameo via video". Judy Greer and Toby Kebbell replace Devyn Dalton and Christopher Gordon as Cornelia and Koba, respectively. Filming of Dawn of the Planet of the Apes started on North Vancouver Island in April 2013. The film was released July 11, 2014. On January 6, 2014, 20th Century Fox announced a third installment with Reeves returning to direct and co-write along with Bomback, with a planned July 2016 release. In January 2015, Fox delayed the release to July 14, 2017. On May 14, 2015, the title was given as War of the Planet of the Apes, later re-titled to War for the Planet of the Apes.